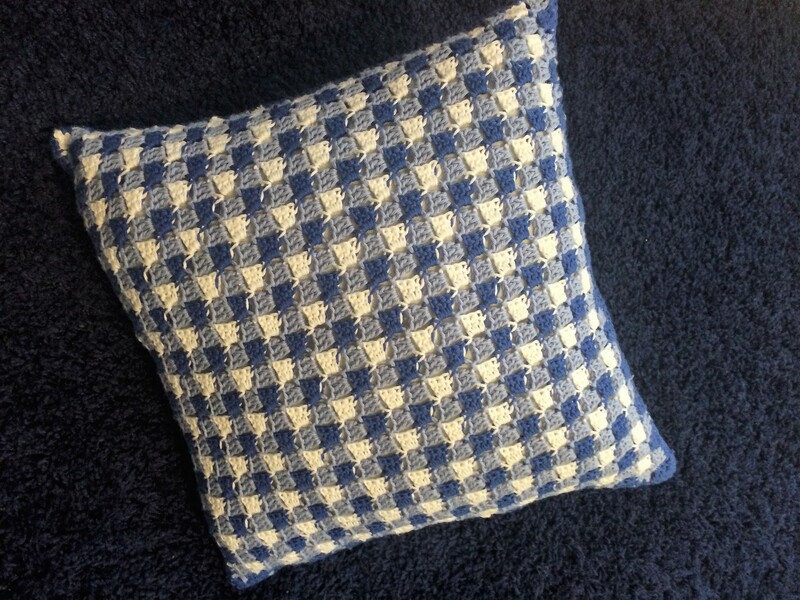 Create a Gingham Crochet Pillow from two corner to corner crochet squares. 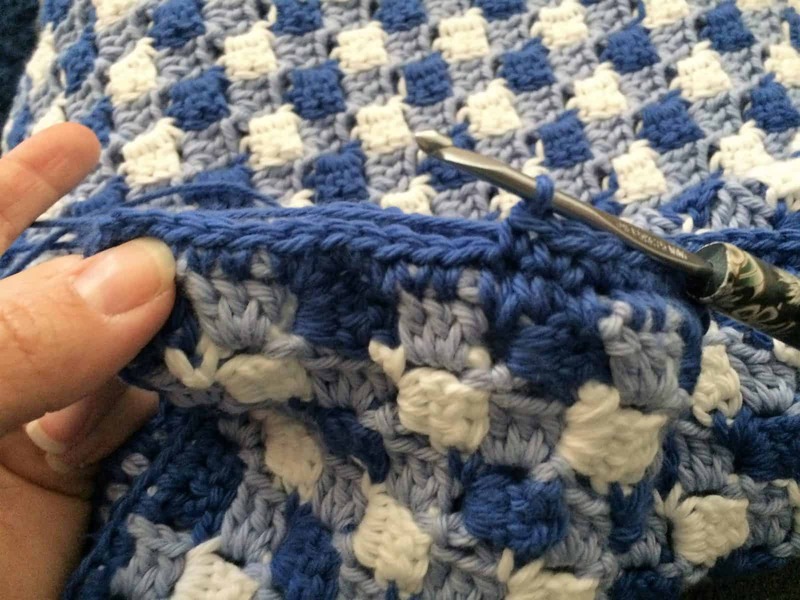 Using corner to corner (c2c) achieves the gingham look and minimizes the color changing to only every other row. 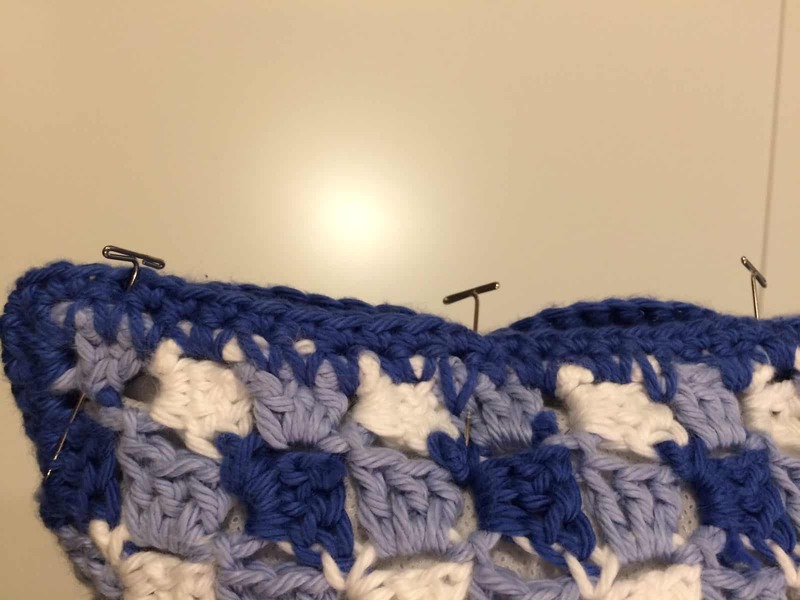 Then adding a seam around the finished squares will allow you to crochet over all those tails, which means less ends to weave in! Yay! I so dislike weaving in ends, just when I think I’m done! The corner to corner technique is worked up in a diagonal. 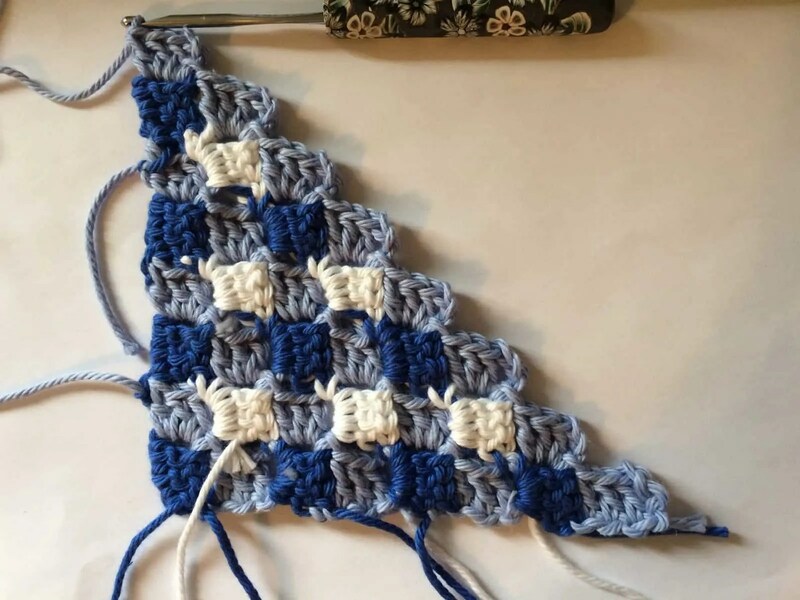 To begin, your starting block is the tip of a triangle and from there each row increases that triangle, until you’ve reached the widest point in your project. 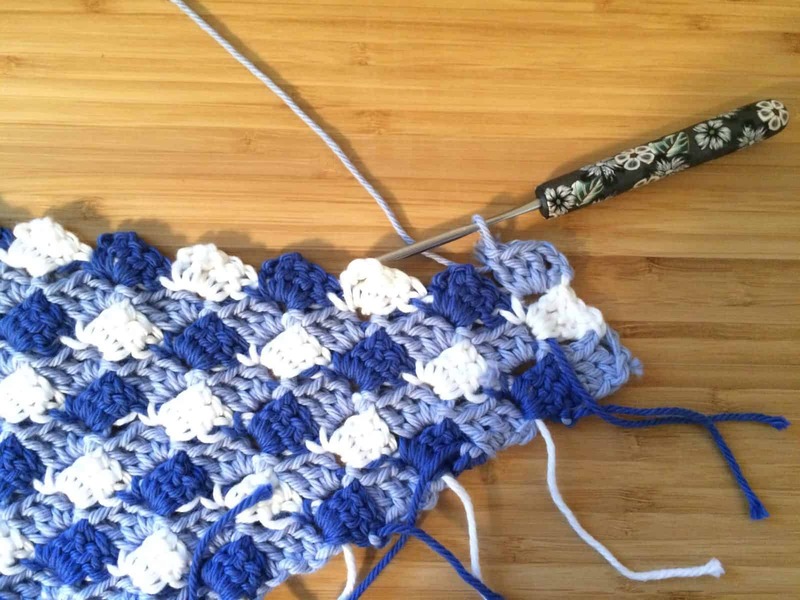 Next you begin decreasing row by row, finally finishing when a square is formed. 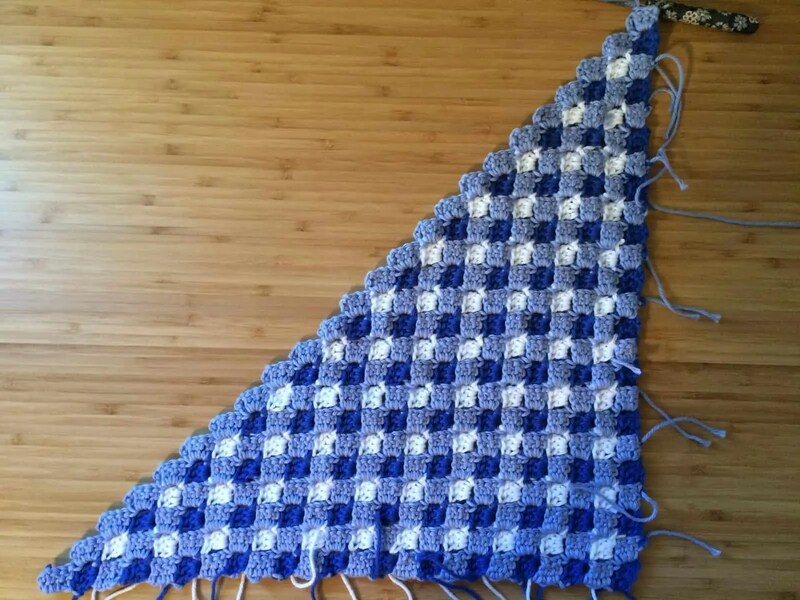 Every row is formed by blocks of double crochet stitches. 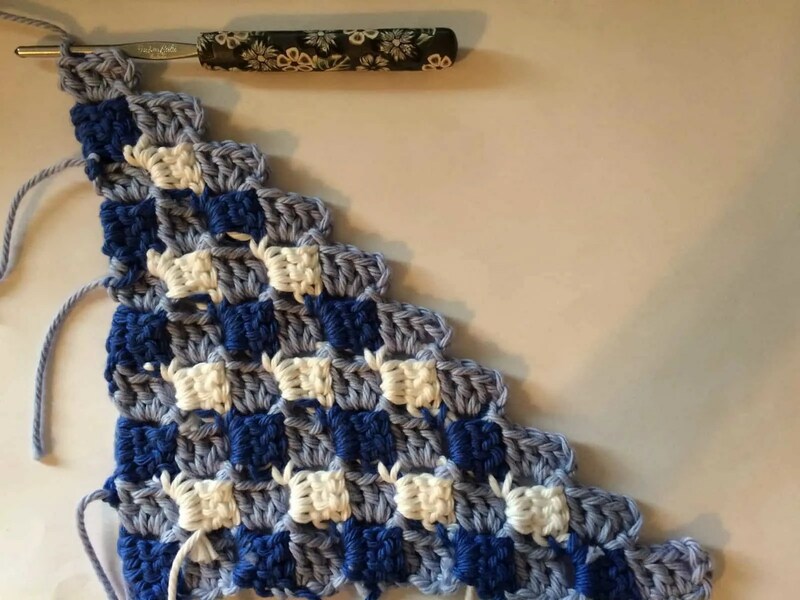 Each block starts with a chain 3 (except the first block of a new row), which counts as 1 dc, and then 3 dc for a total of 4 stitches. 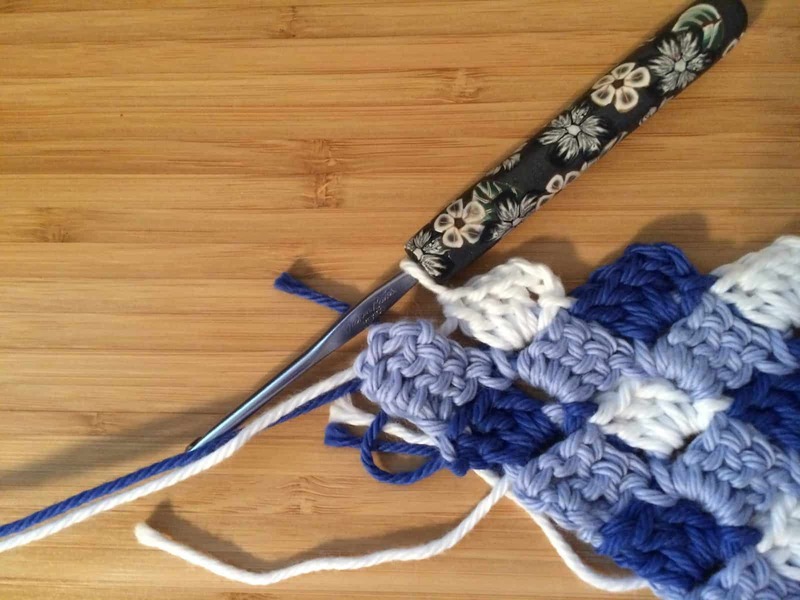 The first block of a new row, when increasing, starts with a Chain 6. 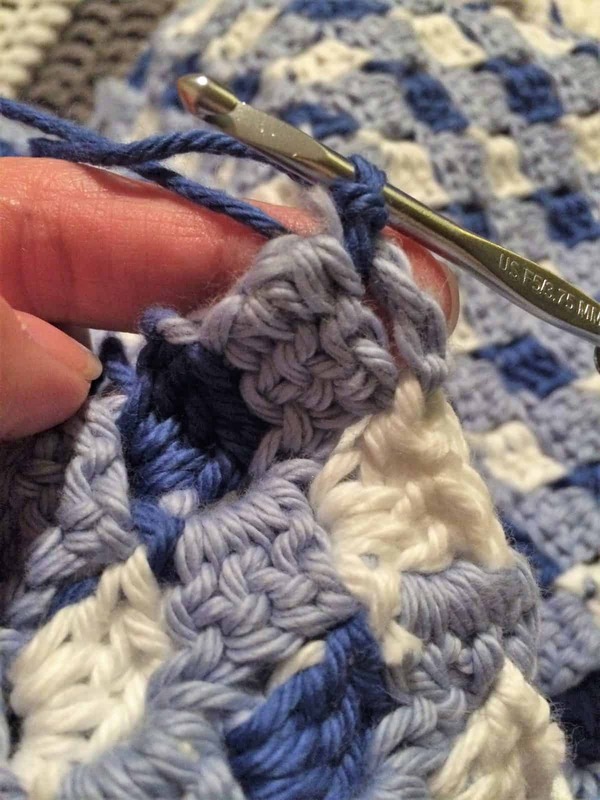 Every decreasing row starts with 3 slip stitches before continuing to crochet your blocks. 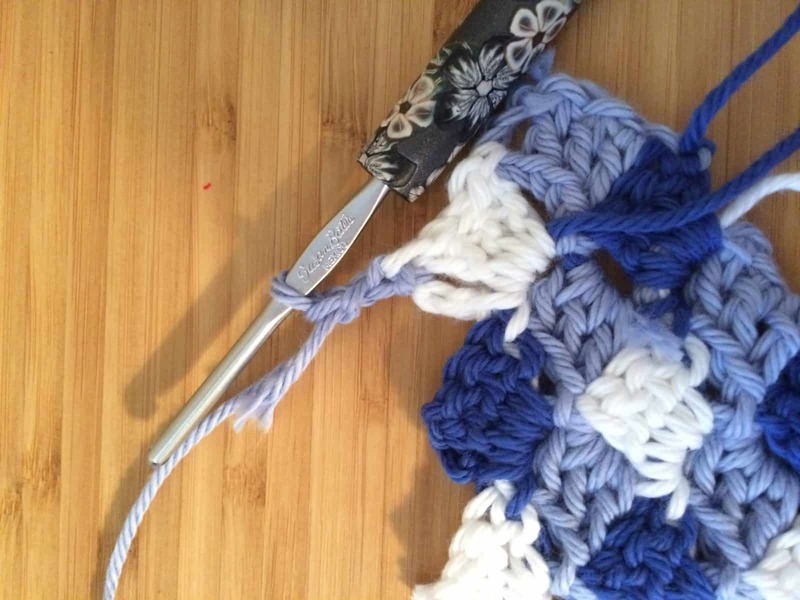 Once you get the hang of it, your piece works up quickly and you won’t even need to refer to the pattern. Get access to all the freebies in my Resource Library when you join my email list! Sign up for my email list here! *affiliates, read more about them on my disclosure page & thank you for supporting my blog! 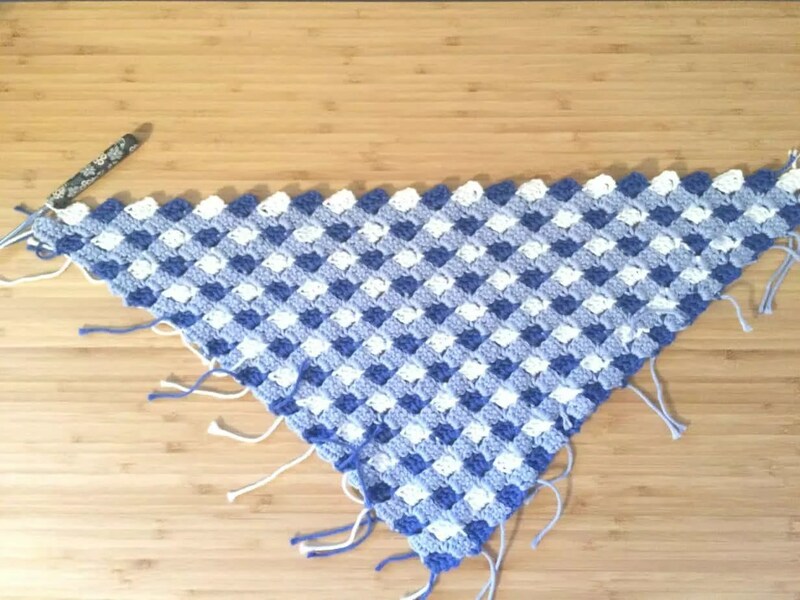 I Love This Cotton yarn in (2) Royalty, (1) Periwinkle and (1) White. 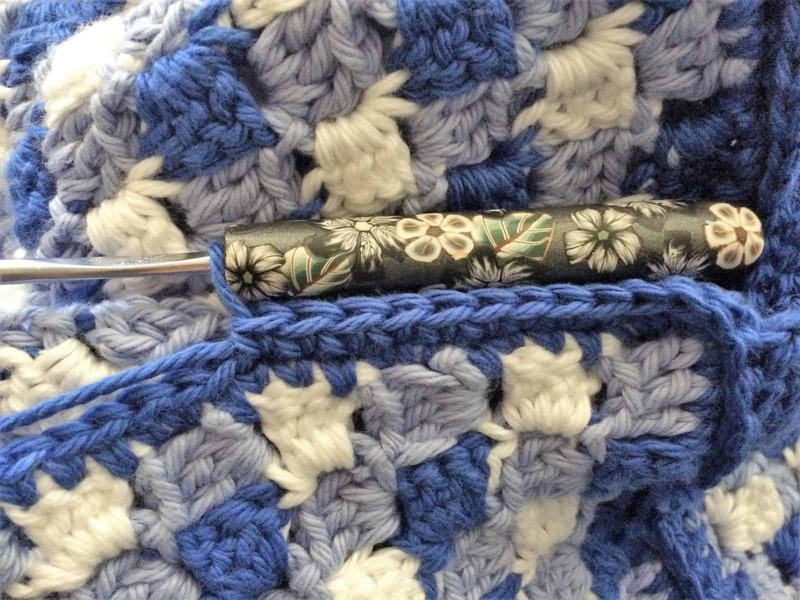 Hook size F, the one I’m using is Midnight Magnolias from Happy Crochet Hooks. Here’s a 20% off coupon code if you want to check them out! 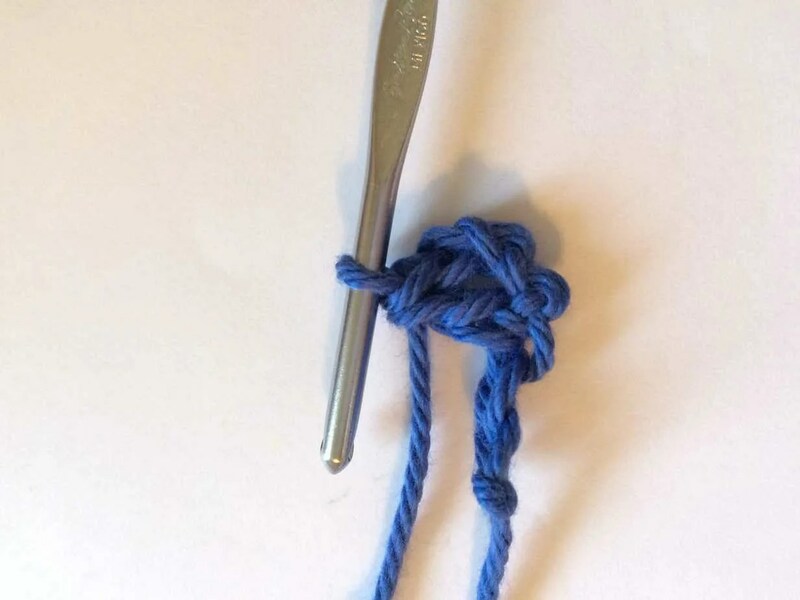 yarn needle* for weaving in ends and sewing your finished pillowcase together. Click here to purchase an ad-free pdf chart of this pattern in my Etsy shop! 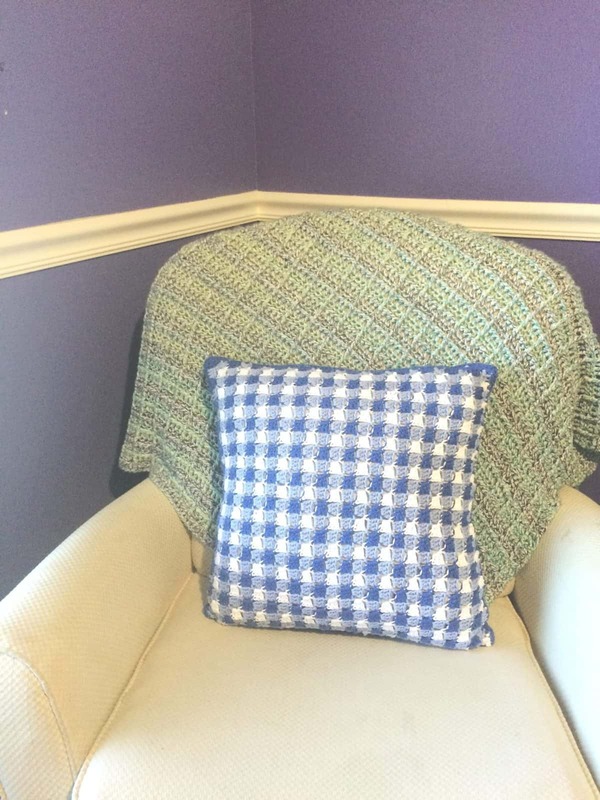 Finished pillow squares are 16″ X 16″ before edging. 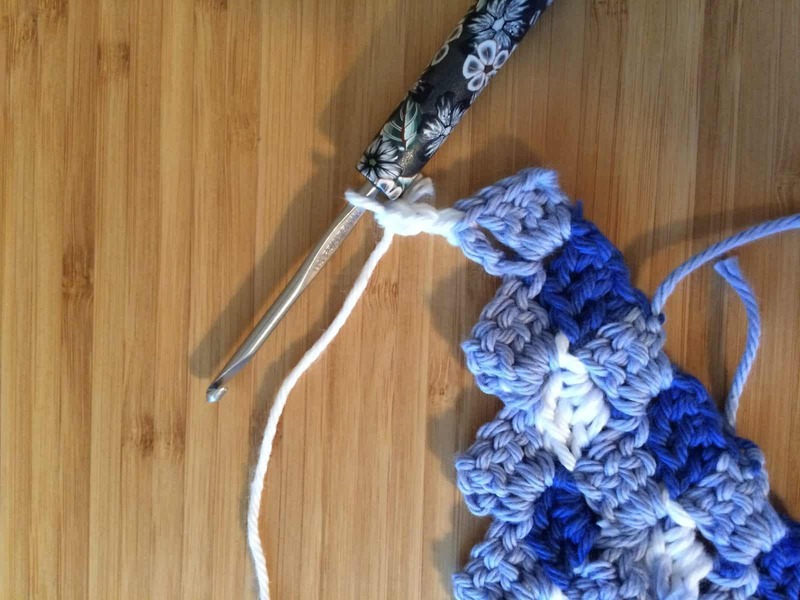 Double crochet into the next chain. 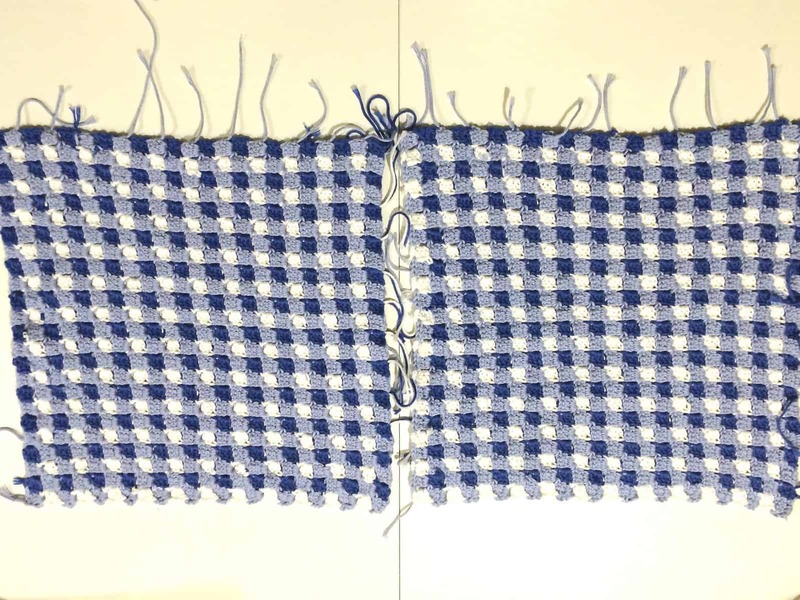 With a slip stitch, join your Periwinkle block to the Royalty block in Row 1, between the last two stitches as shown. 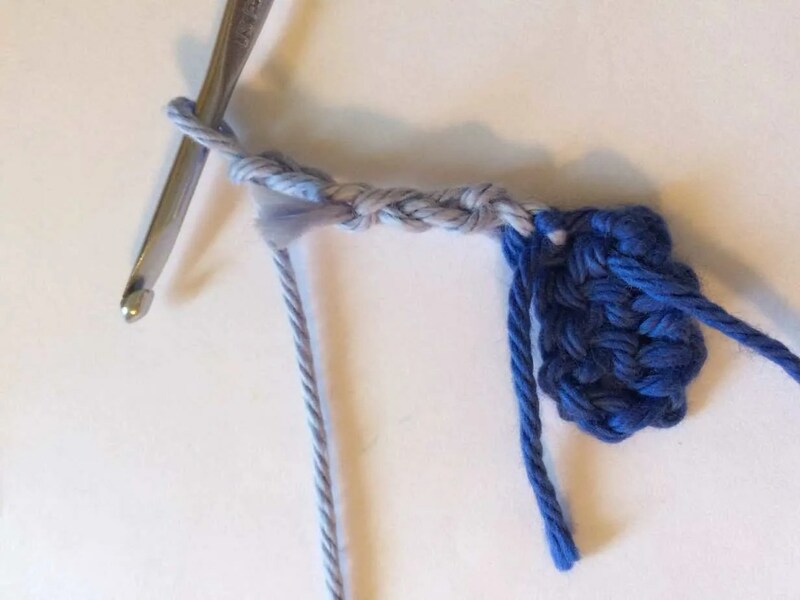 Chain 3 (counts as first double crochet). Double crochet 3 more times (around the last stitch of Royaltyl block one) to make the 2nd block in Row 2. Change to Royalty on last stitch. Turn. 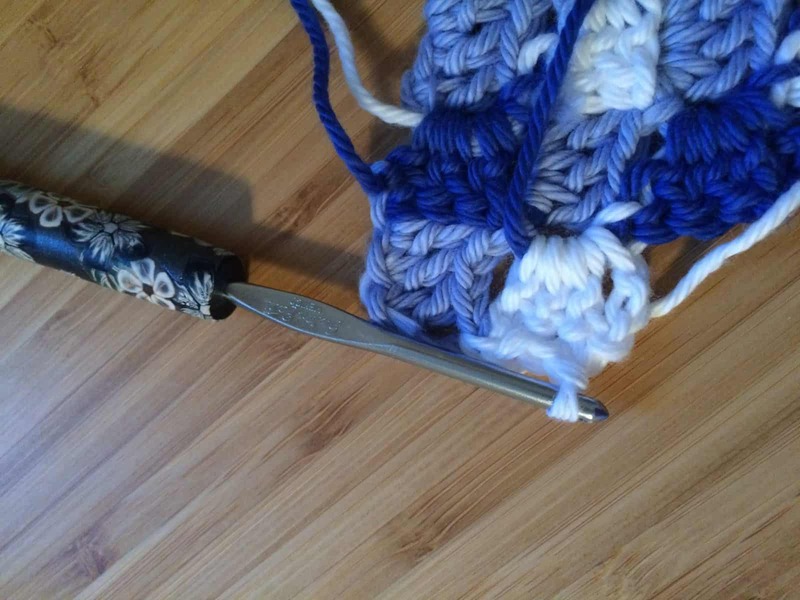 Double crochet into 4th chain from hook and last three chains. Change to white in last stitch. 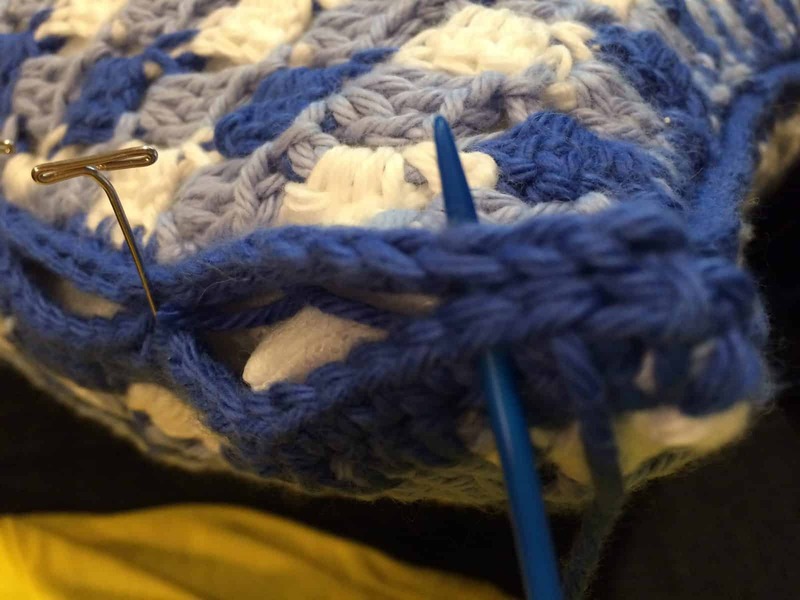 Slip stitch between last two stitches of first block from Row 2. 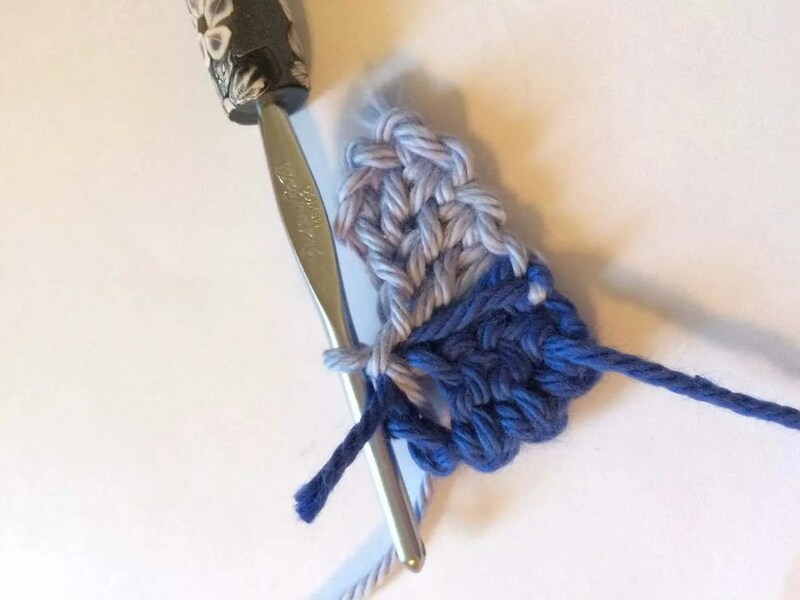 Chain 3, Double Crochet 3 times. Change to Royalty on last DC. Slip stitch to 2nd block from Row 2. 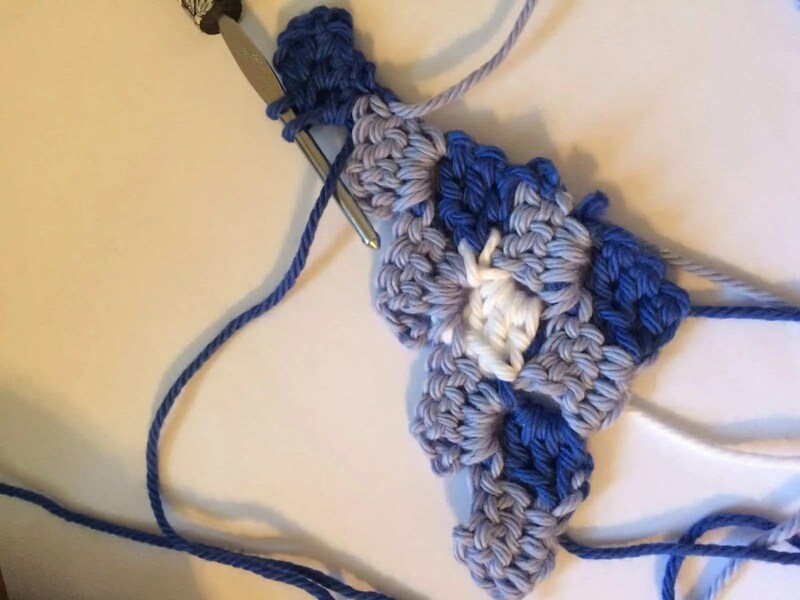 Chain 3, Double Crochet 3 times, change to Periwinkle on last DC, turn. Chain 6. 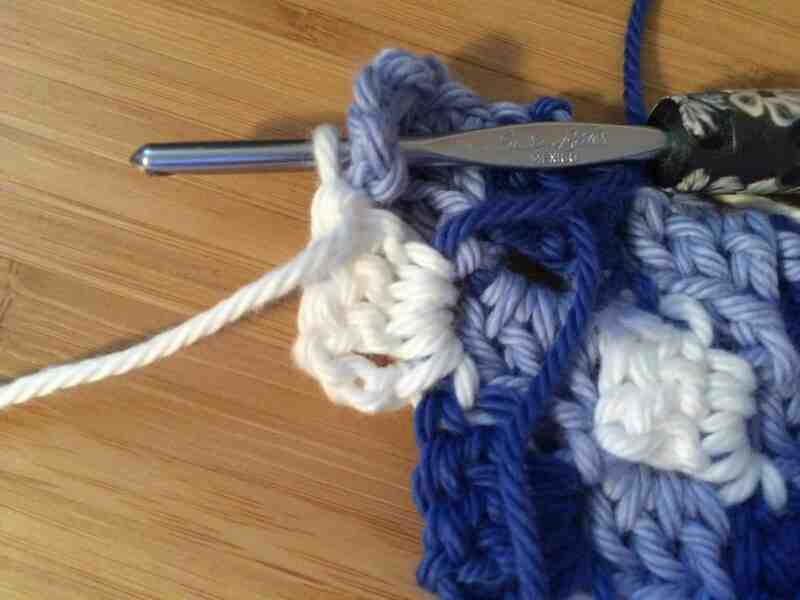 Double Crochet into 4th chain from hook and next three stitches. 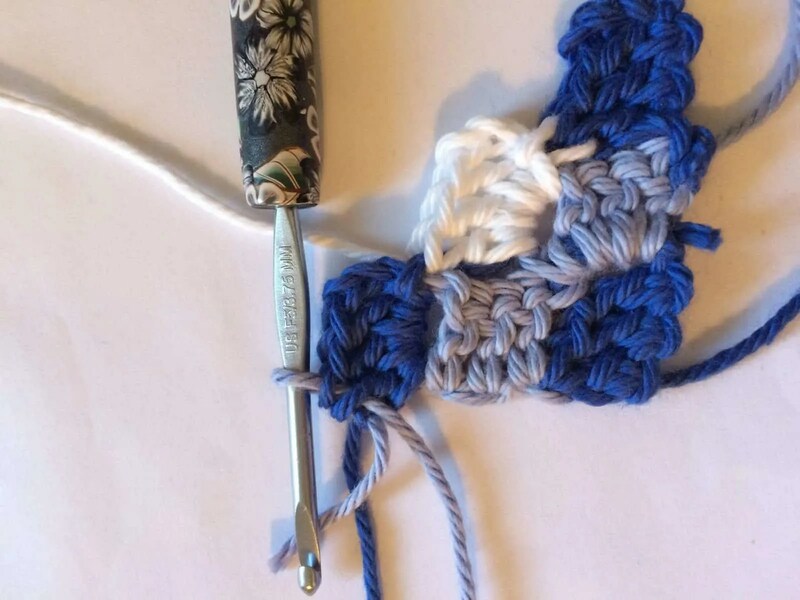 Slip stitch to Royalty block and chain 3, Double Crochet 3 times. 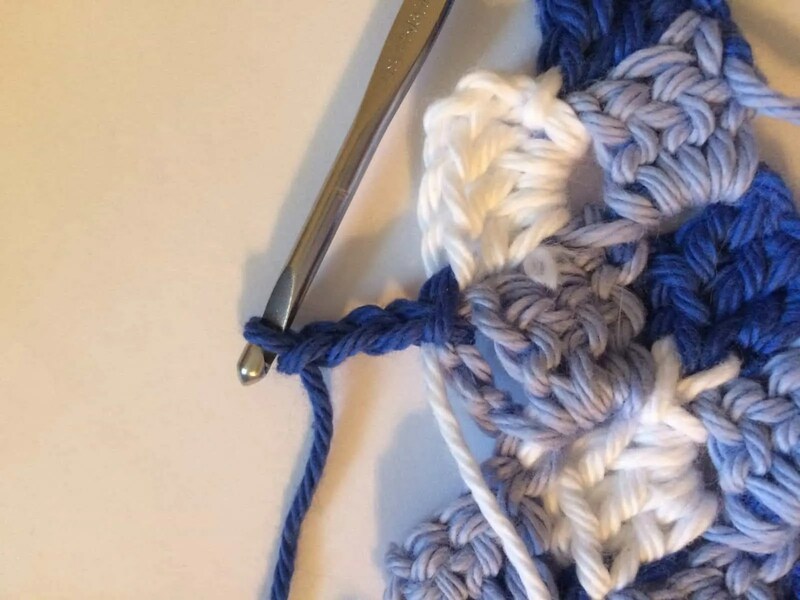 Slip stitch to white block, chain 3, Double Crochet 3 times. 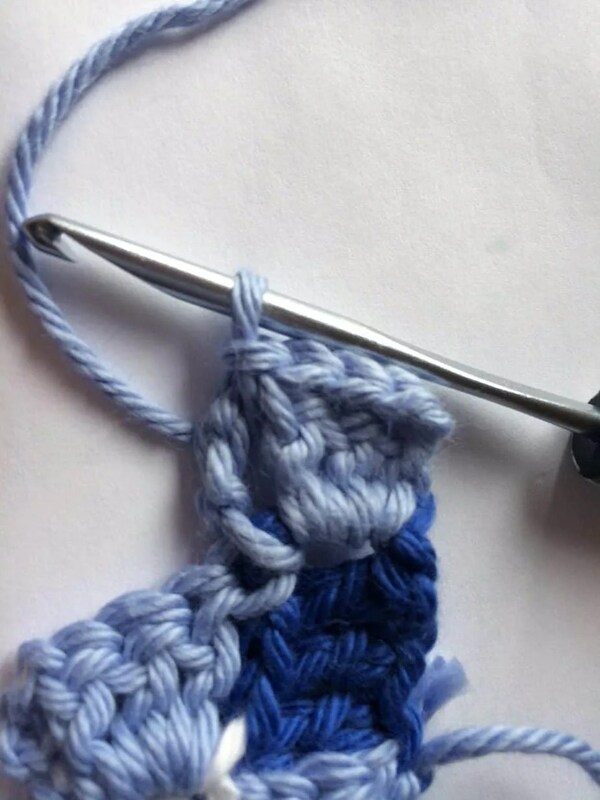 Slip stitch to royal block, chain 3, Double Crochet 3 times. Change to Royalty on last DC. 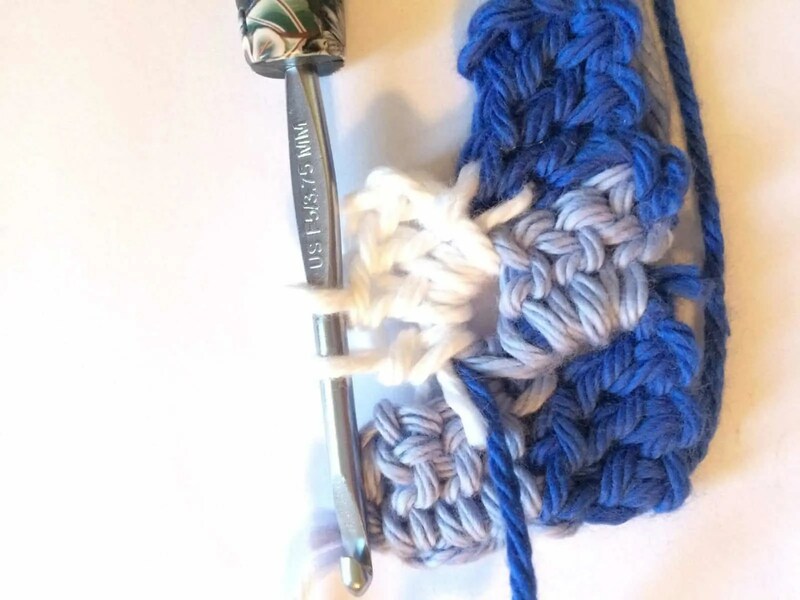 Chain 6, Double Crochet into 4th chain from hook and last three chains. Change to white on last DC. 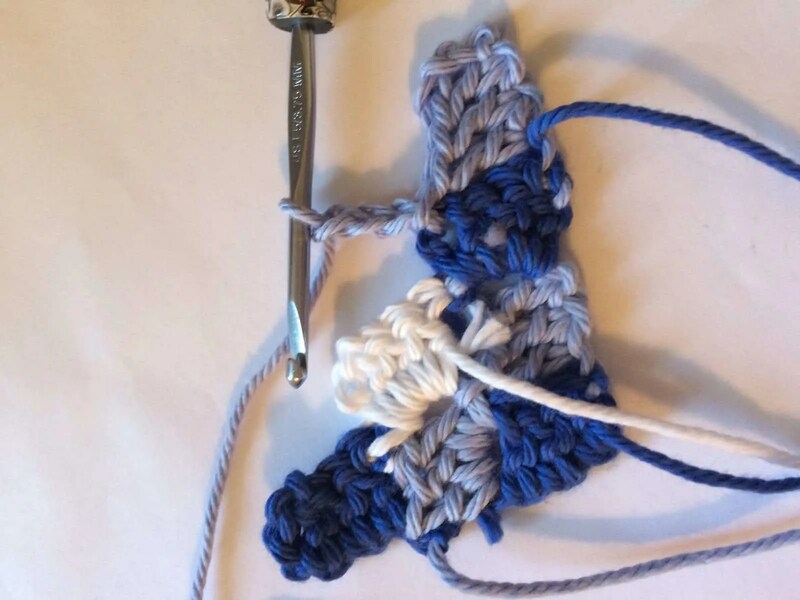 Slip stitch to Periwinkle block one from row 4, Chain 3, Double Crochet 3 times. Change to Royalty on last DC. 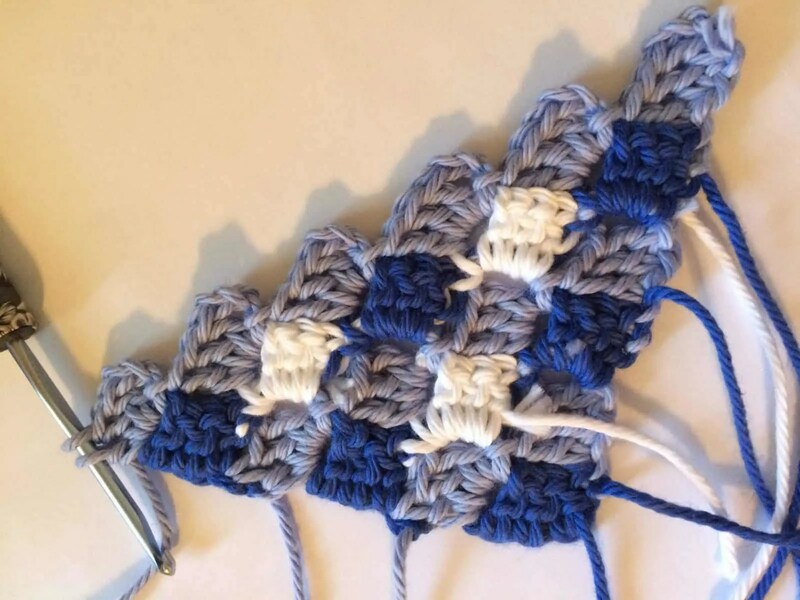 Slip stitch to 2nd Periwinkle block from row 4, Chain 3, Double Crochet 3 times. Change to White on last DC. 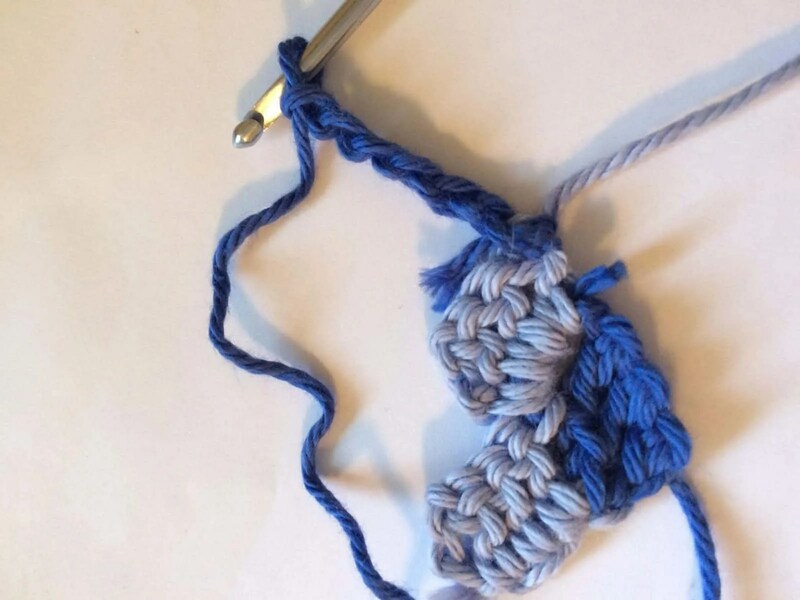 Chain 3, Double Crochet 3, change to Royalty and slip stitch to previous row. 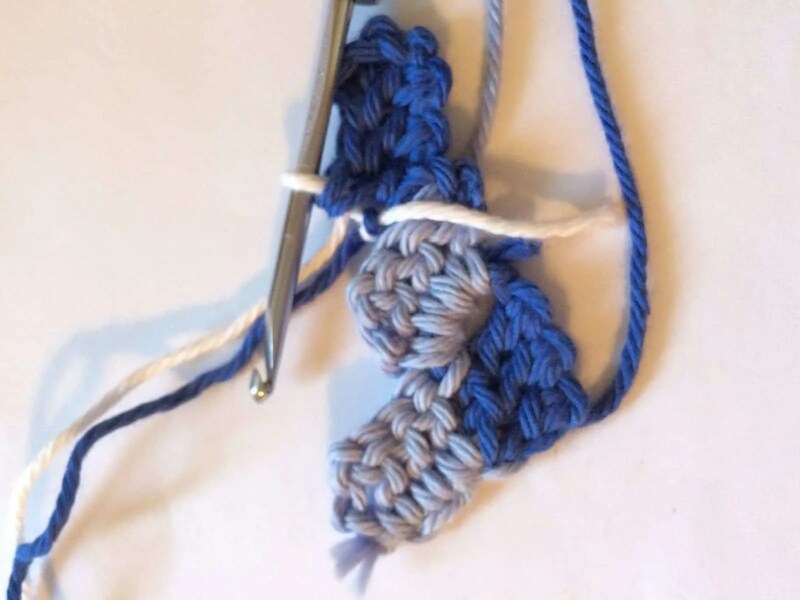 Chain 3, Double Crochet 3, change to Periwinkle and turn. Chain 6, Double Crochet in 4th chain from hook and in last 3 chains. 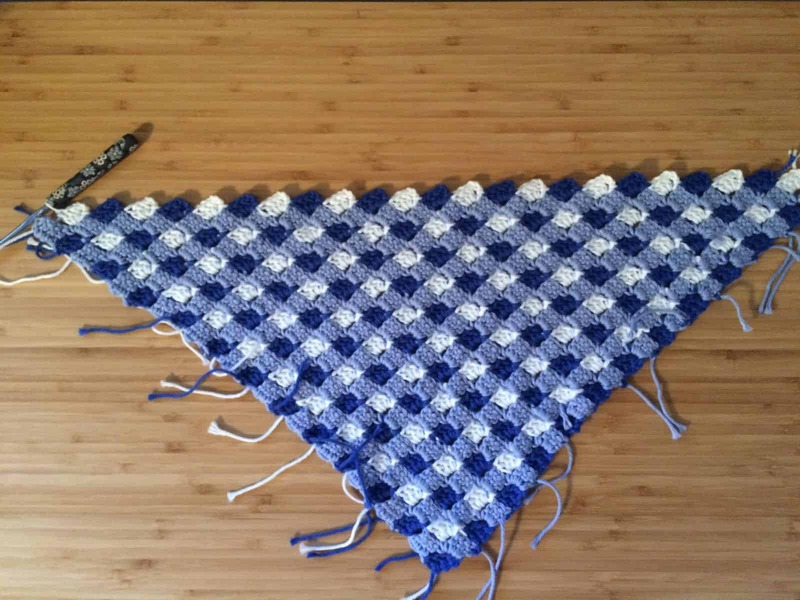 Slip stitch to Royalty block from row 5. 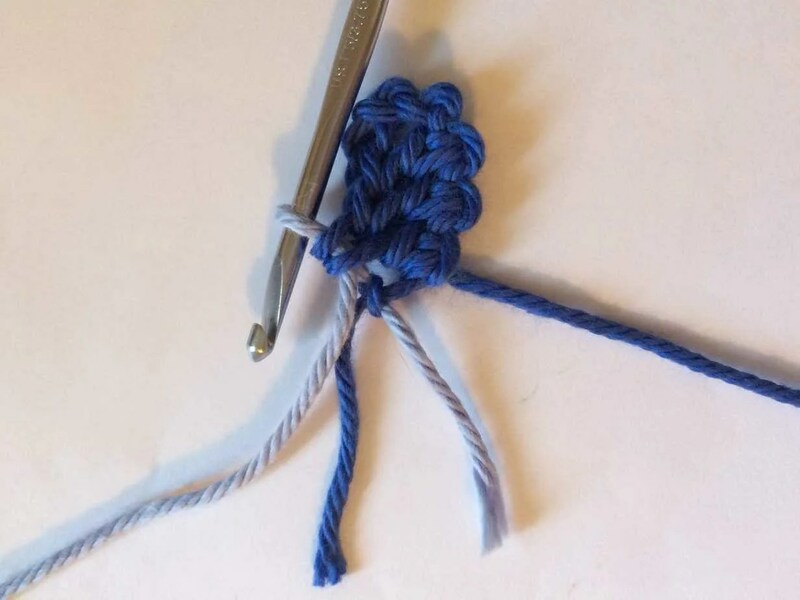 Chain 3, Double Crochet 3. 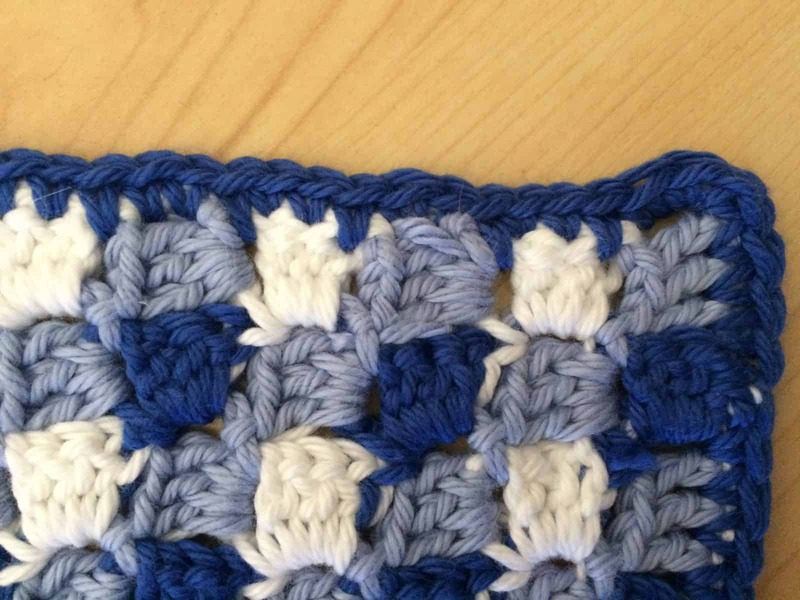 Slip Stitch to White block. 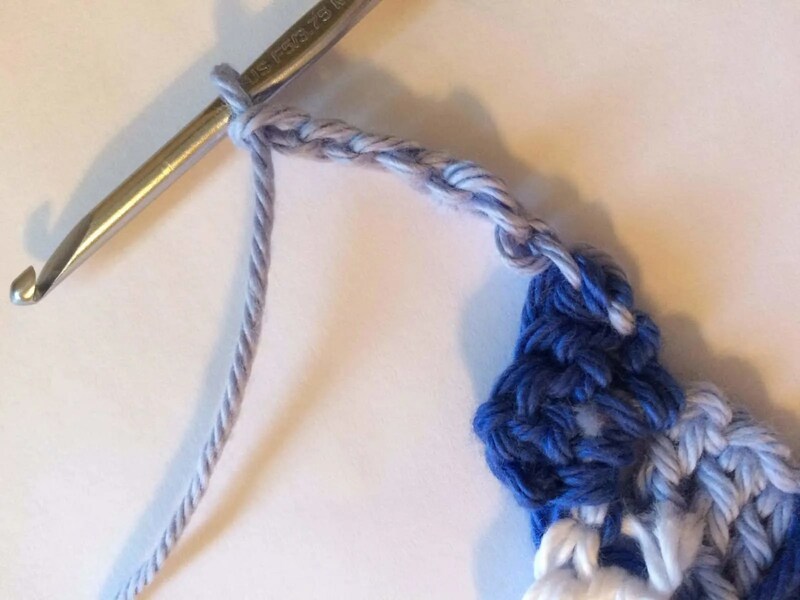 Chain 3, Double Crochet 3, Slip stitch to Royalty block. 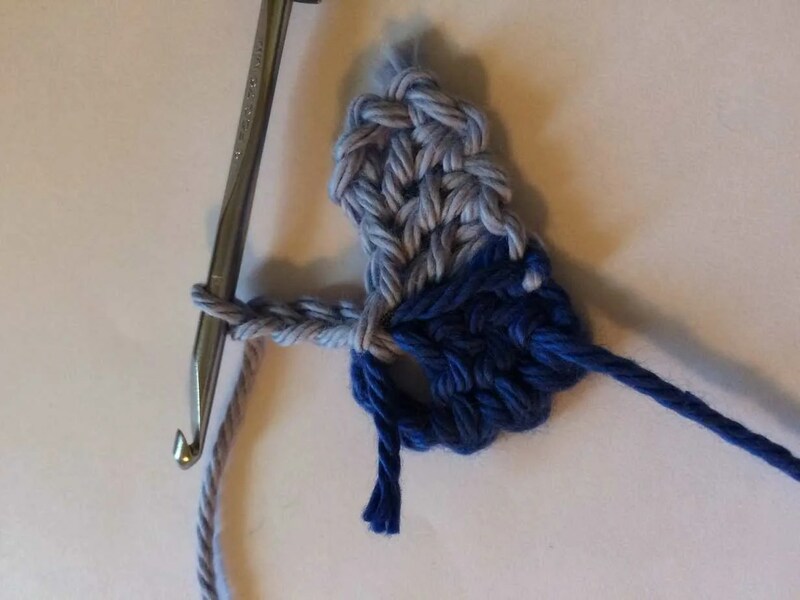 Chain 3, Double Crochet 3, change to Royalty on last DC, turn. Chain 6, Double Crochet in 4th chain from hook and in last 3 chains, change to white on last DC. 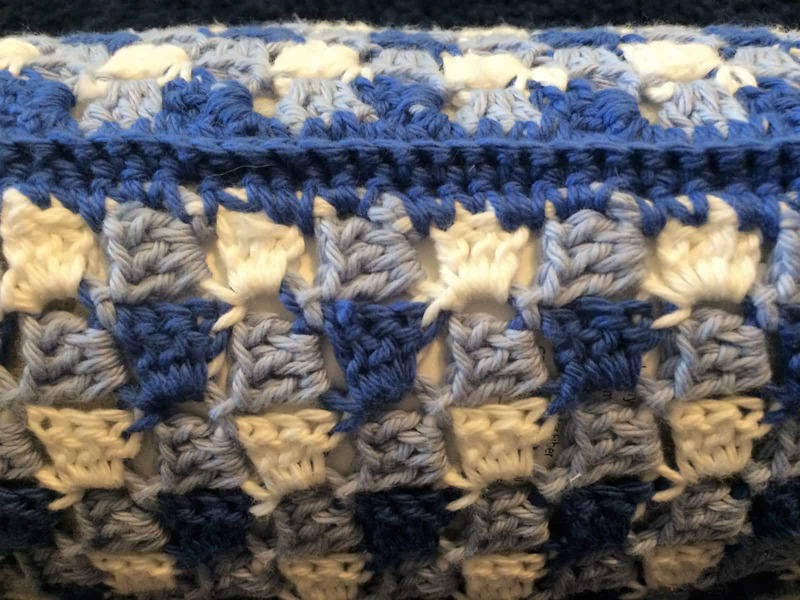 Slip stitch to periwinkle block from row 6. 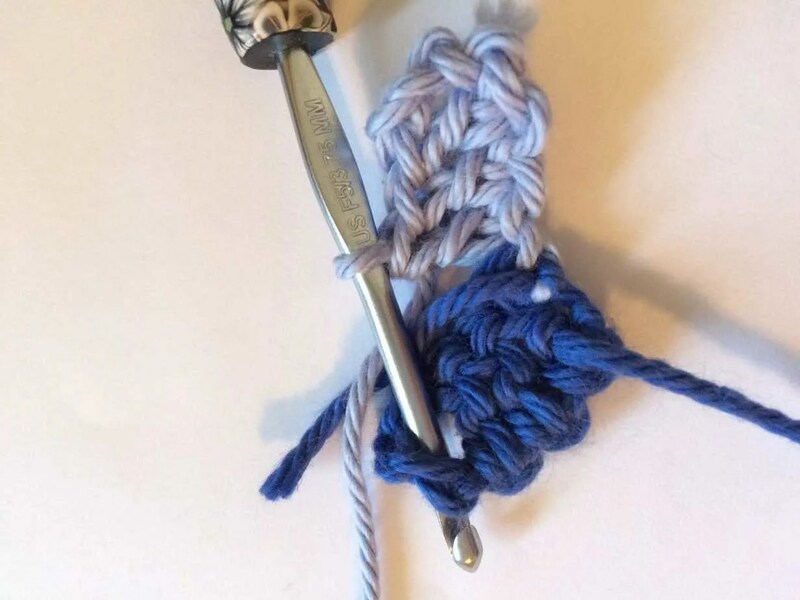 Chain 3, Double Crochet 3, change to Royalty on last DC. 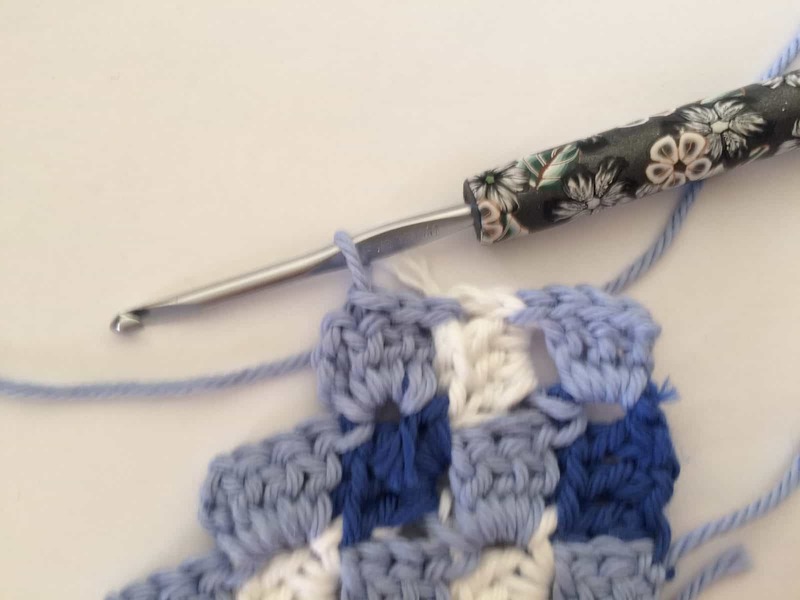 Slip Stitch to periwinkle block. 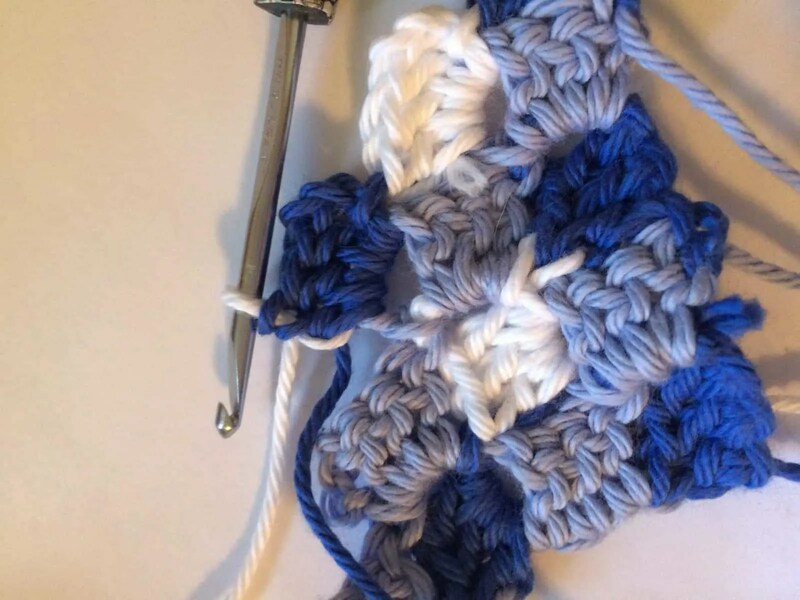 Chain 3, Double Crochet 3, change to White on last DC. 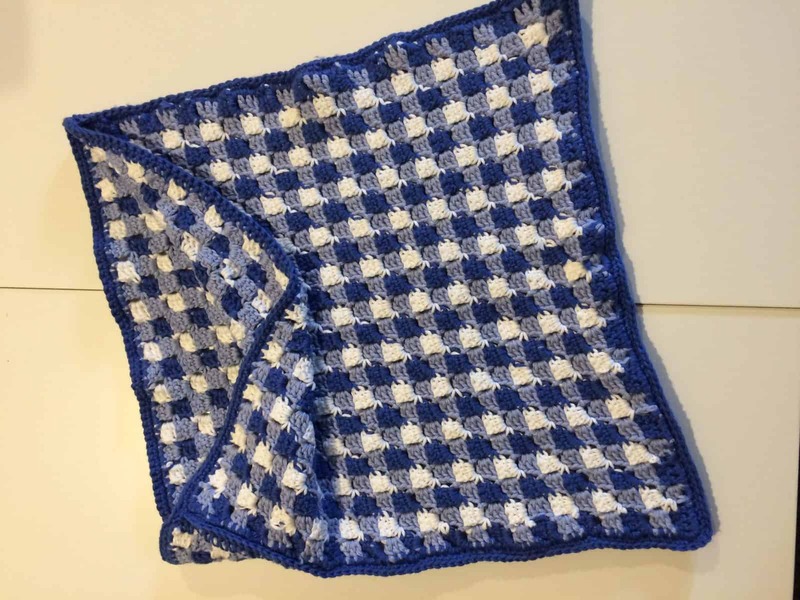 Slip stitch to periwinkle block. 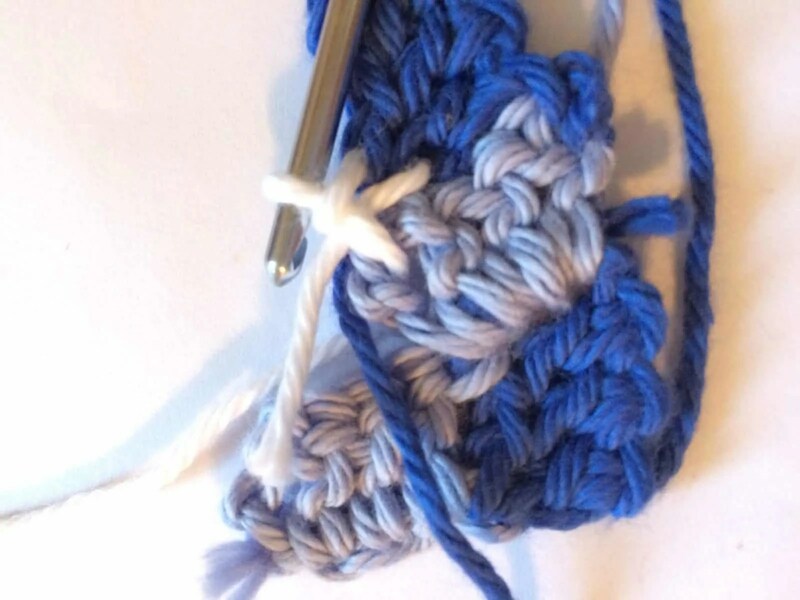 Chain 3, Double Crochet 3, change to Periwinkle on last DC, turn. 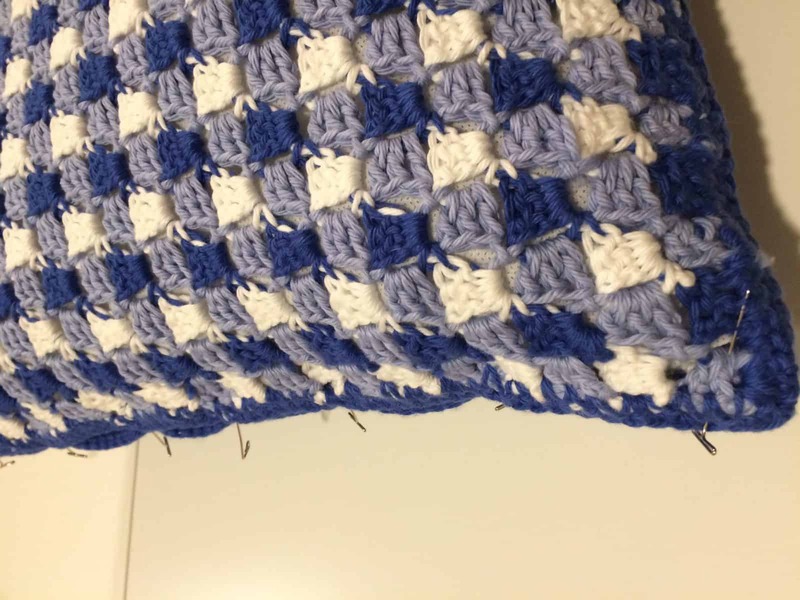 Slip stitch to Royalty block from previous row. 9 blocks, alternating between Royalty and White. 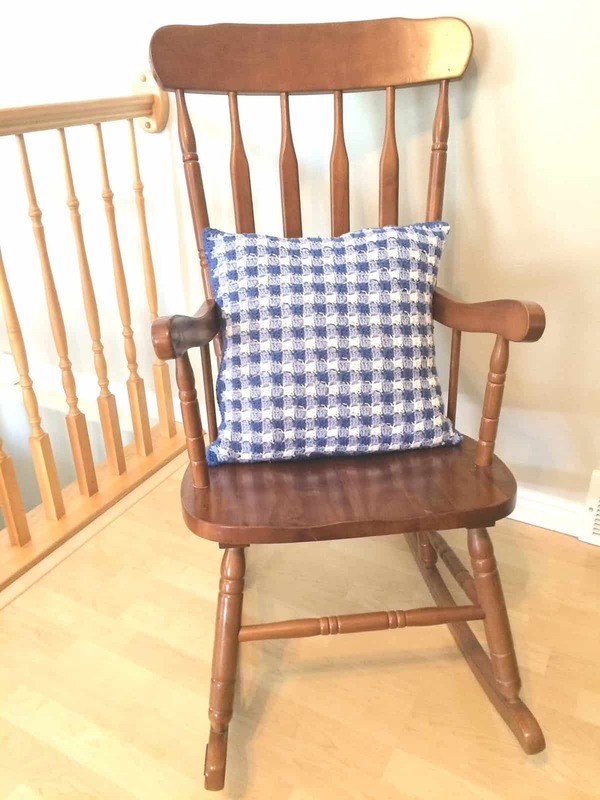 Continue the alternating pattern until your triangle measures 16″ tall for an 18″ throw pillow, mine was 24 rows. On the last block of Row 24, Slip Stitch across 3 times. 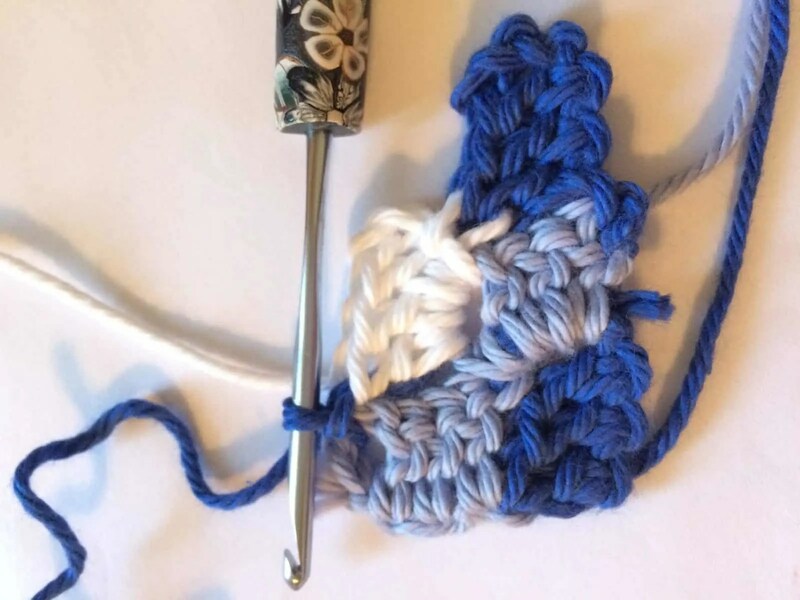 Join White, crochet one block in white, change to royal and crochet one block. 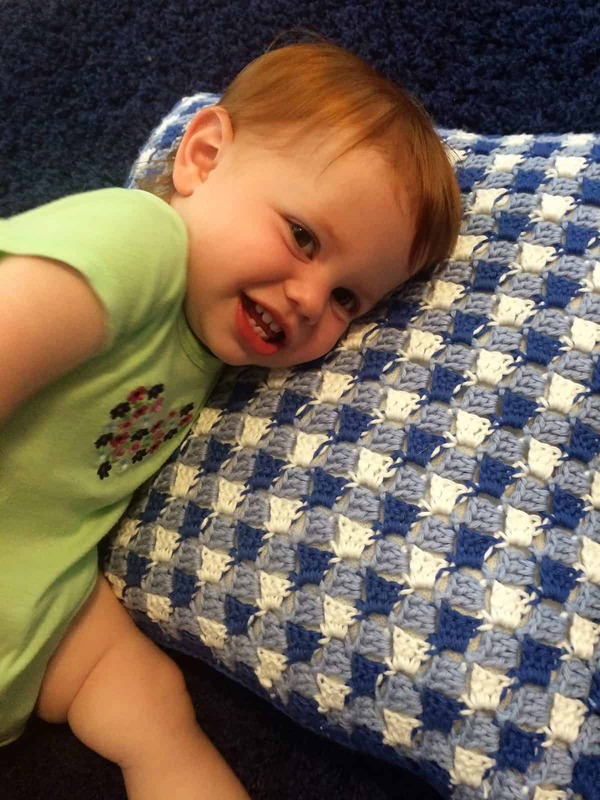 Continue the alternating pattern across the row. When you reach the end, turn. 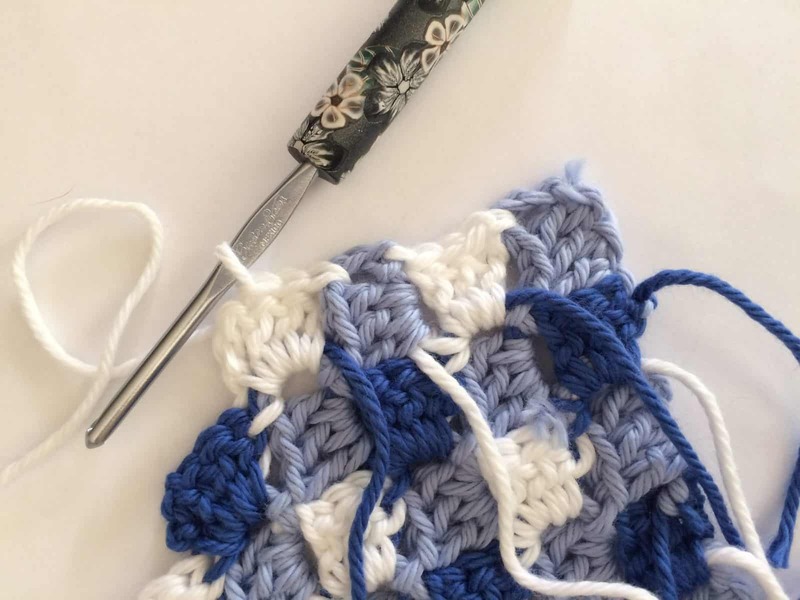 Join your last block to block from previous with a slip stitch. 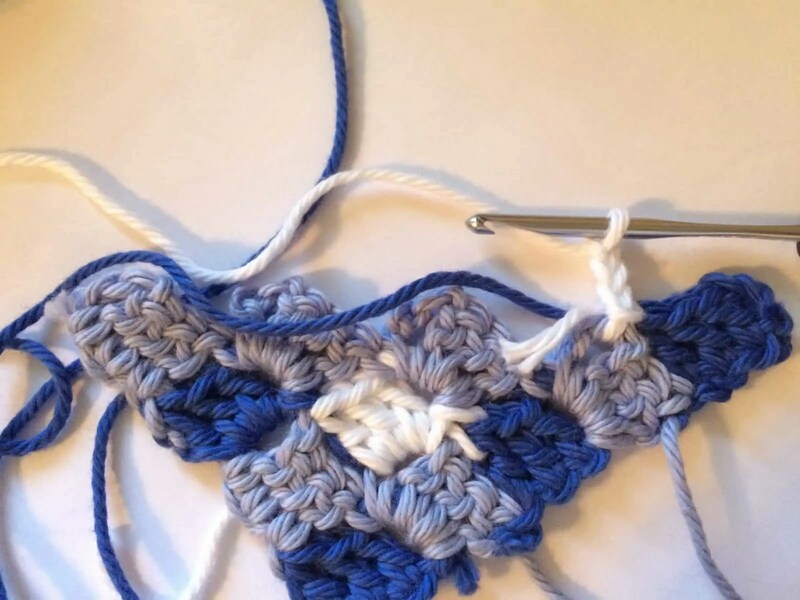 Slip stitch 3 times across your last block. 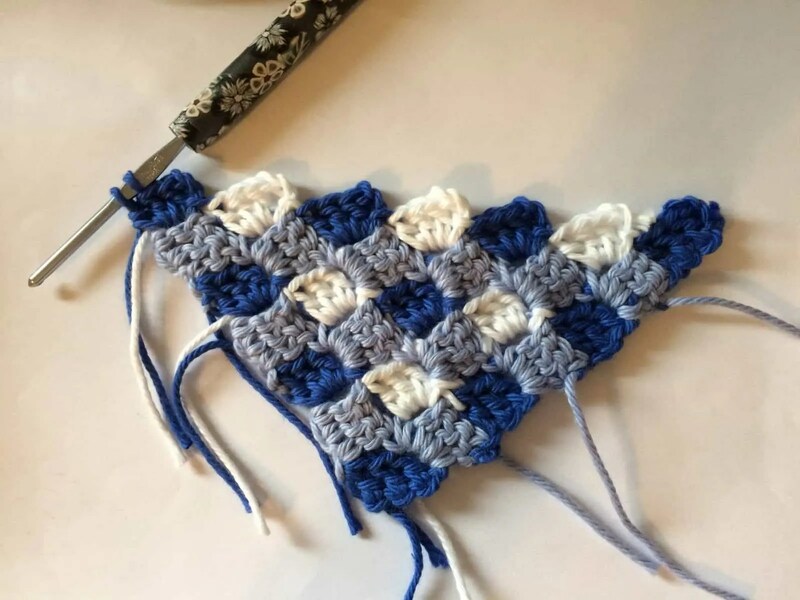 Join next color and crochet blocks in pattern across the row. 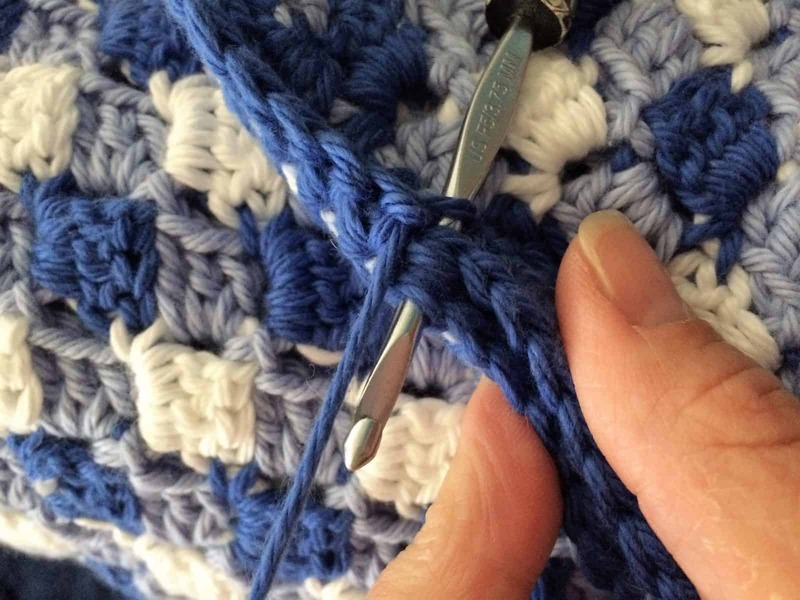 Continue crocheting your rows in the alternating pattern, decrease every row as above. 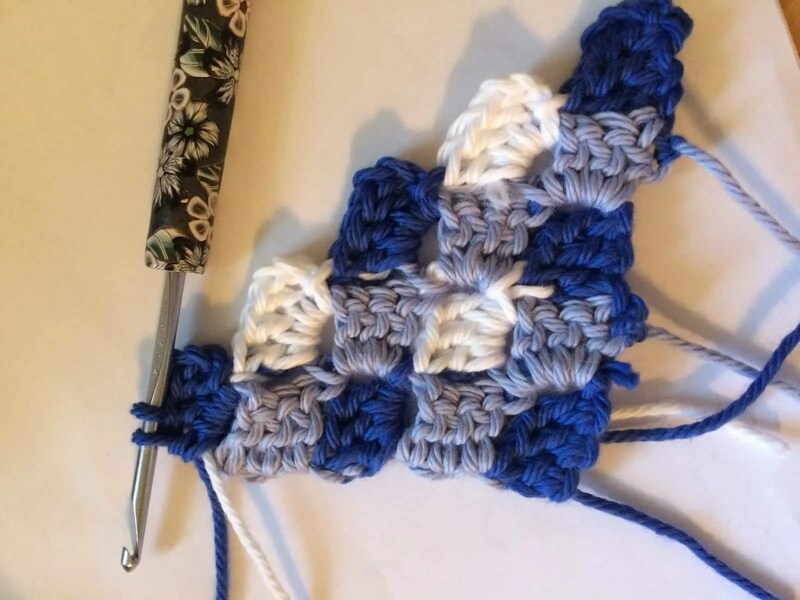 Make 2 squares. Only weave in ends that are in the middle section, not around the outer edge (as pictured above). 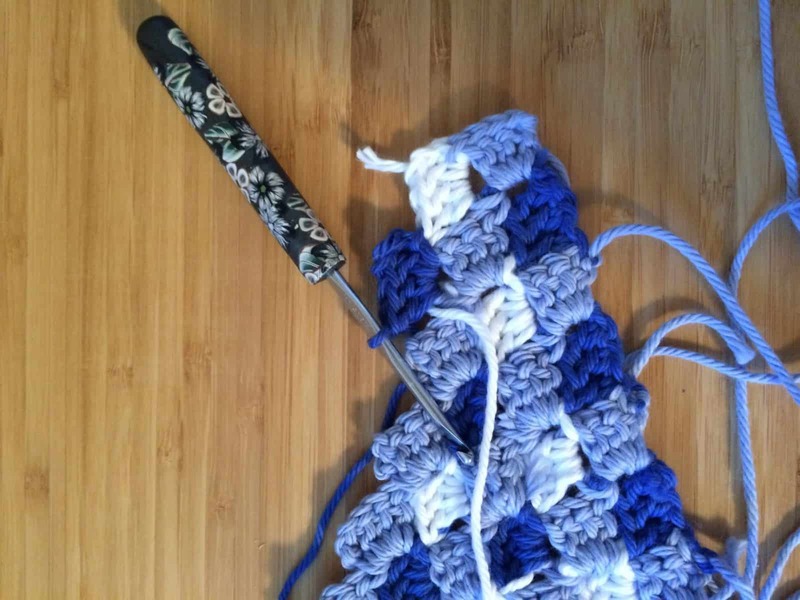 This is where you crochet over all those tails! First join Royalty in any corner. 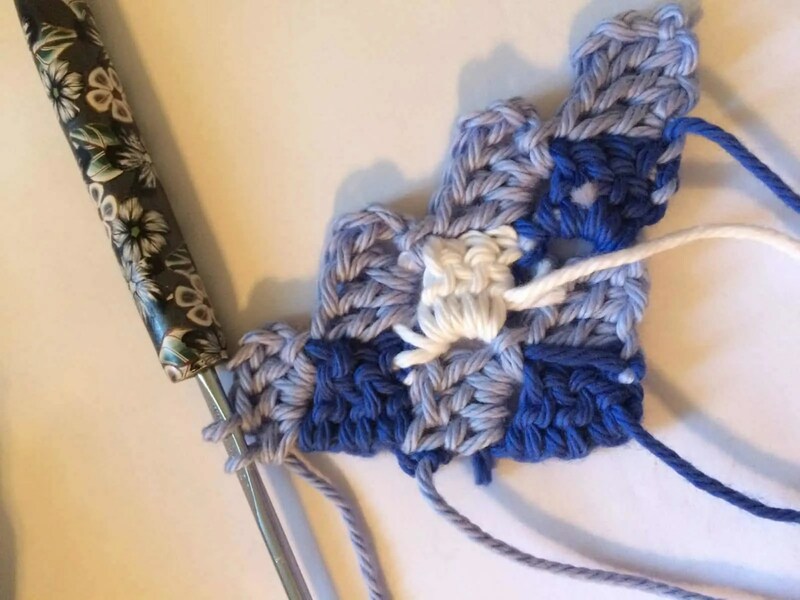 Then single crochet around your square, placing about 3 sc per box. In corners, sc, ch.1, sc, to keep their shape. Now repeat with the second square. 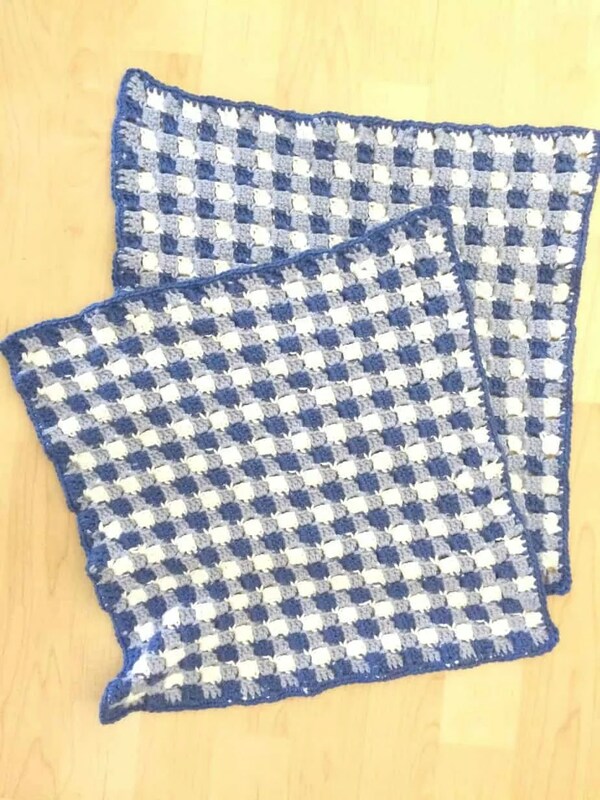 First lay your squares on top of one another, and be sure to match up your square pattern. 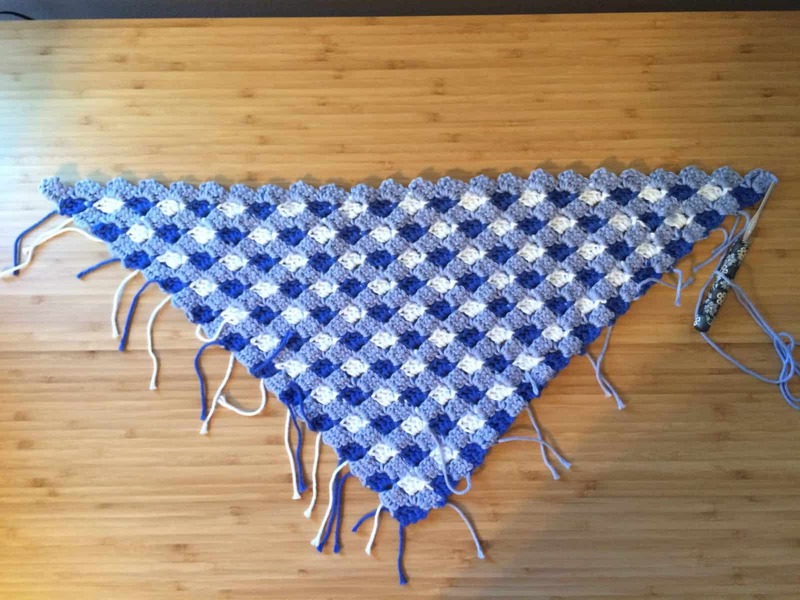 As you can see, the bottom open edge is white & periwinkle squares (the other three are royalty & periwinkle). 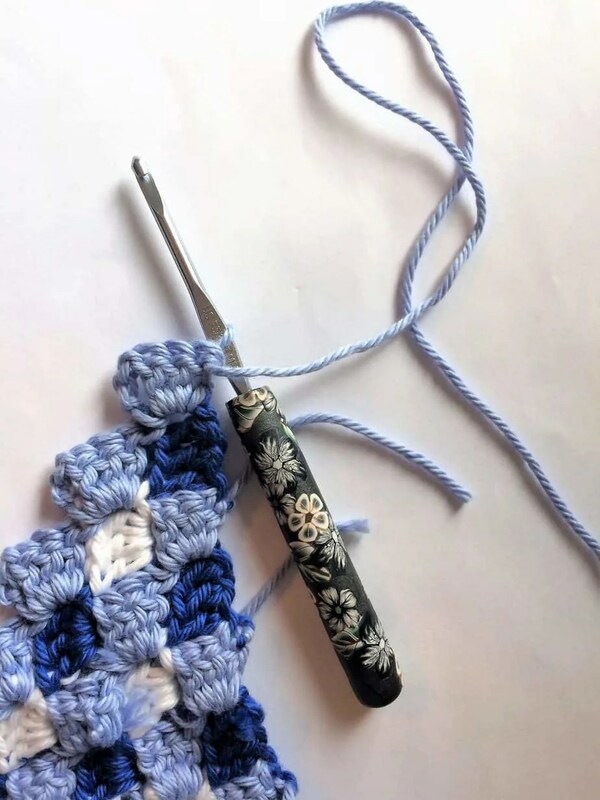 Next line up your border stitches from both squares and then single crochet the two squares together on three sides only. Be sure to leave the bottom edge open for stuffing your pillow form inside. When you come to a corner, sc, ch 1, sc, to keep them squared. Now, stuff your pillow form inside. Next, match up your bottom row and pin. 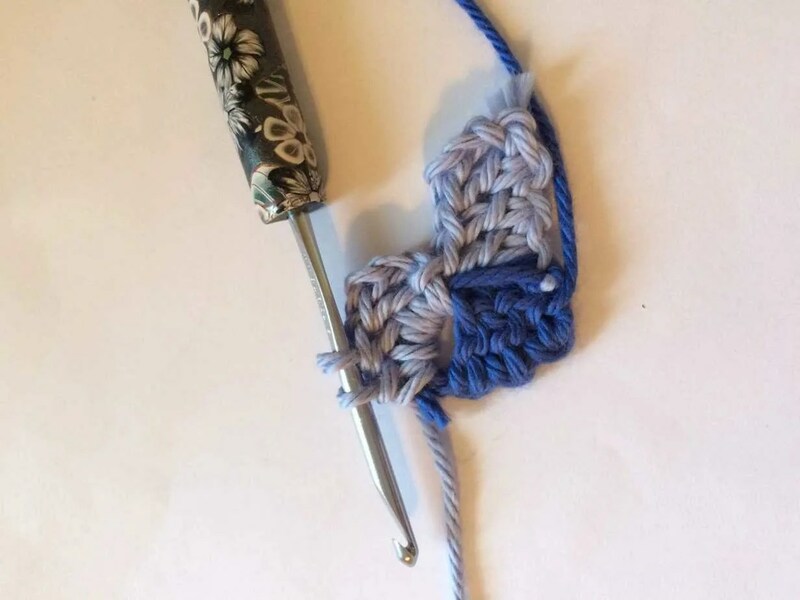 T-pins are so helpful with crochet projects. 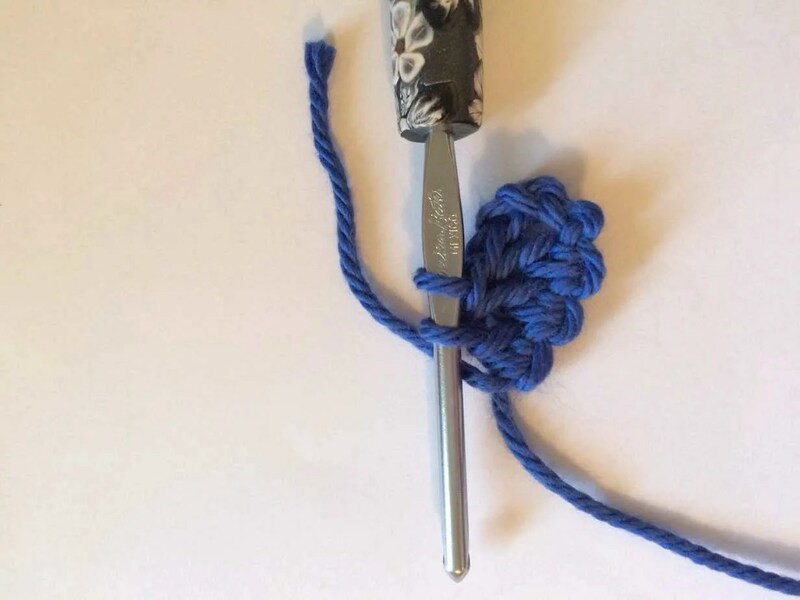 Once it’s all pinned, you can finally sew it together. 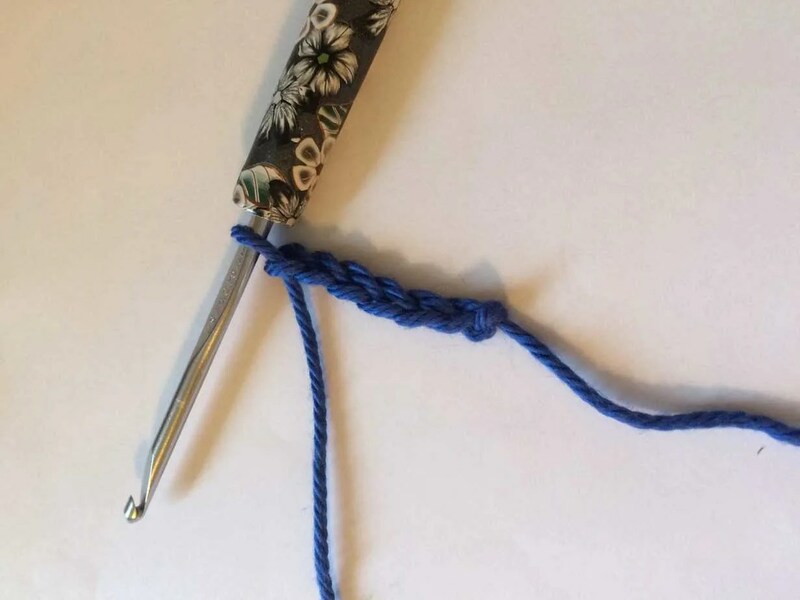 Use your yarn needle and a length of Royalty yarn for sewing. I usually double the length of the area I want to sew. So if it measures 18″, then I’d use 36″+ to sew it together. Now you’ll have a nice seam edging around your pillow. Find a cutie to cuddle it! I subscribed to your newsletter so I would receive a free color chart – “Get this pattern as a printable color chart when you join my email list!” But I didn’t see any download appear with the chart. How can I get this? Uh oh, that doesn’t sound good! Sorry to hear that. I’ll look into shortly when I can get to the computer. If you would send me your email address to christacodesign@gmail.com then I will email it to you when I get a chance.